There are about 1300 languages that have the New Testament translated, but do not have the Old Testament. It is hard to imagine not having the Old Testament. You would not know God’s revelation of himself and his character, his interactions and instructions to His People, the Psalms, and the Bible Jesus knew. Tribes and peoples are begging these organizations to send someone to translate ALL of God’s revelation for them. The Jerusalem Center for Bible Translators (JCBT) is a non-profit ministry supporting mother tongue Bible translators. Mother-tongue translators are local people (not Westerners) that intimately know their own language and culture, but they need the knowledge of Hebrew and the Israelite culture to effectively translate the OT. JCBT’s goal is to have at least one mother tongue translator who has been trained in the land of the Bible. Currently JCBT has impacted about 15%, some 75 languages, of the nearly 500 OT translation projects presently in progress worldwide. Niek, connected through to PCC through family, has been involved with JCBT through tutorials that he has given to translators from China, Malawi, Nigeria, Siberia, and Armenia. The course he is teaching this year is part of a 6-month program. Niek will be teaching in Hebrew, in order to eliminate the need and obstacle of another foreign language (English), using a Biblical Hebrew vocabulary and discussing the Biblical texts. The goals of this class are to enlarge the Biblical Hebrew vocabulary of the translator, to internalize the verbal system and improve fluency in spoken Hebrew. 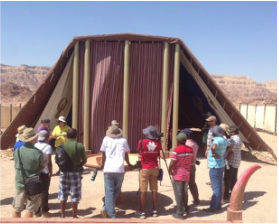 Student Translators will go on many field trips seeing the land of the Bible. Niek’s class will aid them in reading the many biblical passages that will be read on the field trips. If you have any questions, please email Niek & Teranne at niekandteranne@gmail.com. If you would like to support them, please contact the PCC office.